Sights | New England Custom Gun Service, Ltd.
NECG sights have been used by gunsmiths and custom gunmakers the world over. We are also proud of the fact that all of the current U.S. firearms manufacturers, at one time or the other, have used NECG sights in the production of their sporting rifles. 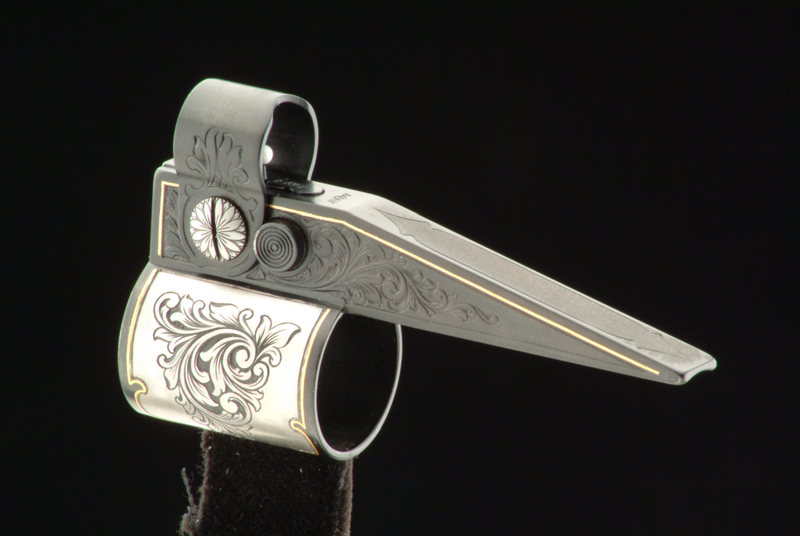 The sights we offer are what we call "neutral" and not made for any specific make or contour of barrel. By offering "neutral" sights they can be fit to any barrel contour. Please do not expect us to have sight sets for a specific gun or model as there are just way too many combinations to inventory or catalog. Help with sight height calculations can be found by following the "Products Information" link on the home page. It will lead you to "Sight Height Calculations" under Open Sights. You will find tips and charts for our most popular sights. The Masterpiece Banded Ramp is widely used by custom makers all over the world. It’s all steel construction and graceful styling make it the first choice of many customers. The ramp will accept all of the Masterpiece Banded Ramp front sight inserts, including silver beads, patridge, fiber optic and folding night sights with both traditional mammoth ivory inserts, and the new "white on white" folding night sight. The hood is locked into position be a spring loaded detent button. Delivered in the white and requires gunsmith installation. Note: Inside diameter is cylindrical and not tapered. The Classic Ramp with Folding Hood is a modern version of a period style sight ramp that dates back to the days of the early express rifles with its flat back tapered ramp and folding hood. The ramp will accept all of the same interchangeable front sight inserts used in their popular Masterpiece Banded Ramp which includes silver beads, fiber optic, patridge and folding night sights. The ramp can be modified to suit the taste or style of any rifle. The hood components have a blue oxide finish and the ramp is delivered in the white ready for fitting. Inside diameter is cylindrical and not tapered. Height to dovetail on all ramps is 10mm / .394”. Overall ramp length: 75mm / 2.95”. Some people refer to them as "peep sights". Others call them "receiver sights" and still others know them as "aperture sights". Regardless of what you call them you will be impressed with the quality, functionality and asethetics of these creations by NECG. Shop Peep Sights for more information. Shop Classic Ramp with Folding Hood Options Below!